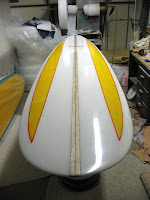 In 1966 and 1967 Challenger Eastern Surfboards were at the top of the curve for quality, West Coast or East Coast. Tinker had a recording studio in the factory where our hot coater and finner would rehearse and record some of his early music for his band, Steel Mill. Tinker asked me to reproduce one of the Challenger Easterns, so this is what I pulled out the stops for. 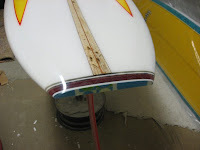 A 9'2" square tail, hips behind center with a slightly pulled 17" nose, glass tail block and a glass on red glass fin. Center stick is a reverse t-band of 2-5/8" spalted balsas flanking a 1/16" redwood center. The rocker is slightly flipped in the tail flowing to a smooth low nose rocker. The bottom is low in the tip of the tail, transitioning to a neutral rail on a slightly rolled bottom. The lamination is clear with rail deck panels consisting of red pin lines around transparent yellow/honey inside the pins. It is ready to ride or nail to the wall. The board was auctioned off by one of the artists from Steel Mill, a guy named Bruce Springsteen, at a benefit at the Count Basie Theater.